Ah spring. That magical time of year when the air smells of poo from all the fertilizer the city dumps on public flower beds, and the trees send sneeze-inducing spores dancing on the wind. We’re moving into a season associated with sweet baby creatures gambolling in green fields. Sweet baby creatures that, as the birds and bees will tell you, must come from somewhere. In the case of baby Myr, that somewhere is your sewing machine. If you’re tired of the usual, clichéd flocks of fleecy lambs and zigzagging parades of chirping ducklings, why not grace the world with more Myr. A basketful of these often-overlooked members of the adorable-creatures club will set you apart from all the Martha Stewart style homes bedecked with paper maché birds nests and napkins folded into bunny rabbits. 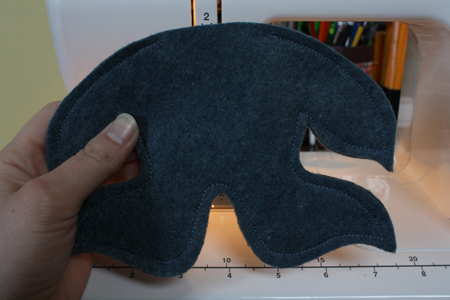 1) Start by printing the pattern (liked above as a PDF) and cutting it out. 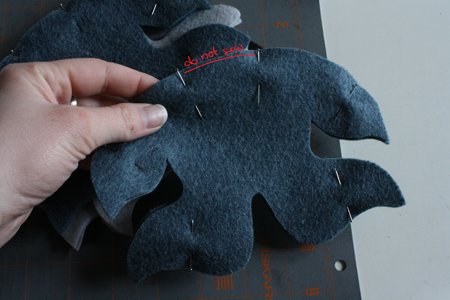 2) Pin the pattern pieces to the felt, and cut out. 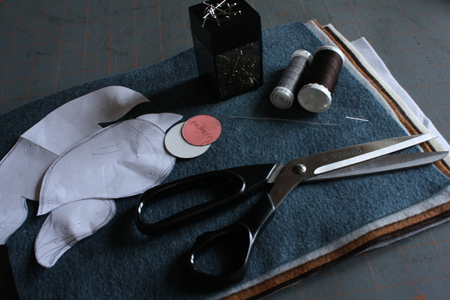 You’ll need two of each pattern piece (head, body, outer eye, inner eye). If you’re using the 8×11 sheets of felt you can get at craft and dollar stores, you’ll need one sheet of felt for each baby Myr. Be sure to cut the outer eye circle from white felt (or some other, contrasting colour of your choice). If you’re making this for a very small child and want to give the toy more sensory stimulation, get a piece of thin crinkly plastic (like a plastic shopping bag or an emptied and washed food wrapper) and cut pattern pieces out of it, as well. 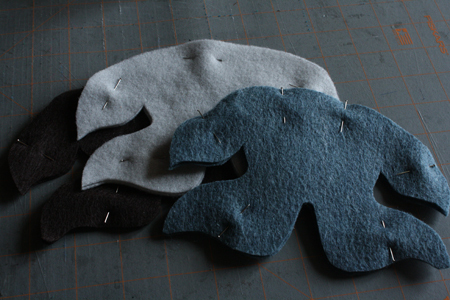 When you sew the pieces of felt together later, layer the plastic pieces on top of them. When you turn the whole thing inside out and stuff it, you’ll have felt on the outside and crinkly plastic on the inside, where it can’t harm the child but makes a fun rustling sound. As kids’ noisemakers go, it’s a fairly parent-friendly sound that’s reasonably low key and won’t drive adults to utter distraction. Another trick is to put a bell or beans/beads/buttons inside one of those yellow plastic Kinder Egg capsules, and insert the whole thing into the stuffed animal along with the stuffing. These critters are probably a bit small for that, though. Plus if you live in the States your government has apparently decided you’re not bright enough to realize that these plastic capsules are not edible, and consequently have banned all Kinder Eggs. So no upcycled plushie rattles for you. Unless grandma has some old-school plastic film canisters in the cupboard that you could substitute. 3) Center each inner eye on top of each outer eye. Then pin them in place on either head piece. 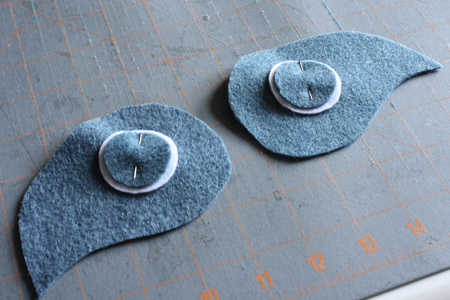 Be sure that you pin them to opposite sides of the head pieces, so that when you sew the head together you’ll have an eye facing outwards on each side, instead of once facing outwards and one (oops!) on the inside. You can easily make sure you’re pinning them on the proper sides by simply facing each head piece away from each other, back to back, as in the photo below. 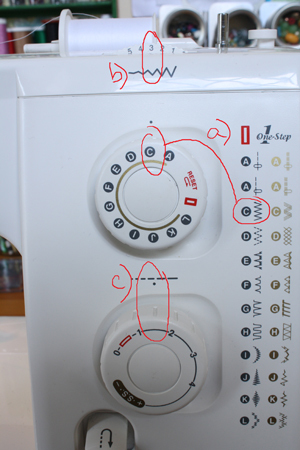 4) Set your sewing machine to do a zigzag stitch (a). Set stitch width (b) at medium and stitch length (c) low. On my machine this means I set the width at 3 and the length at about 1.5. 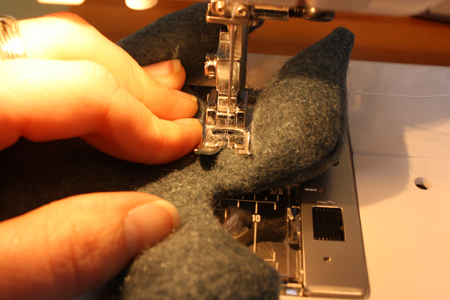 Put white thread (or thread to match whatever other outer eye colour you chose) in your machine. 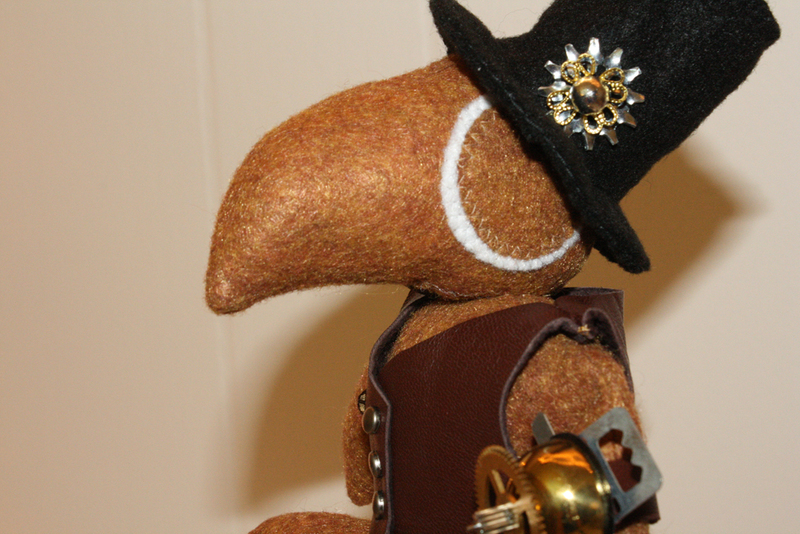 Your other option is, of course, to simply sew the eyes on by hand. This will take a little longer, but unless (like me) you are making a little army of baby myr, the bit of extra time probably won’t make a huge difference. 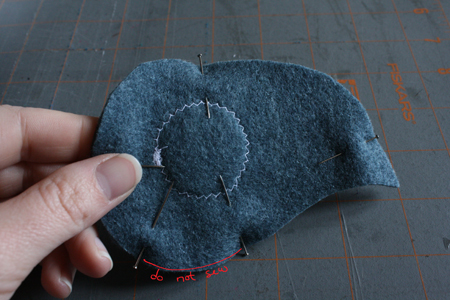 5) Sew around the eyes, sewing right on top of the outer circle. Make sure the thread catches the inner circle as well. Tip: It can be hard to really effectively knot the thread on a zigzag stitch without doing a boatload of backstitching (which looks messy on something this small). To deal with this, I zigzag stitch all the way around, backstitch a bit, then (making sure my needle is out of the fabric) I switch to a straight stitch, and sew a few stitches forward and a few stitches backwards on top of the zigzag stitching, to hold it all in place. 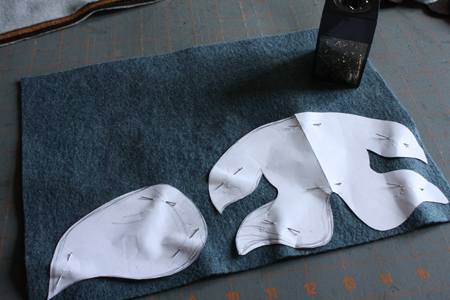 6) Once both eyes are sewn on, pin the two sides of the head together, right sides facing in. 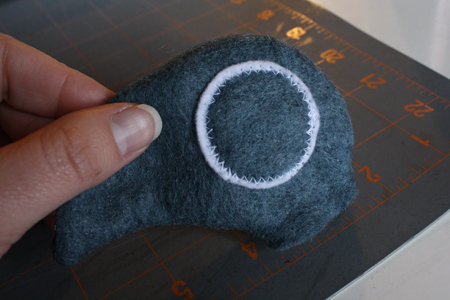 Sew around the edges, leaving an opening about 1 1/2 inches wide at the bottom. 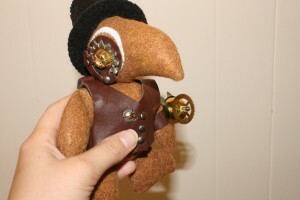 7) Turn the head right side out and set it aside. 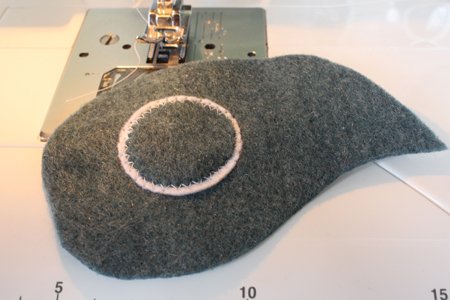 8) Take the two body pieces, pin them together (right sides facing in, if there is a visible right side, which sometimes there is with felt and sometimes there is not) and sew around the edges. Leave an opening about 2 inches wide in the middle of the top, where the neck would be. 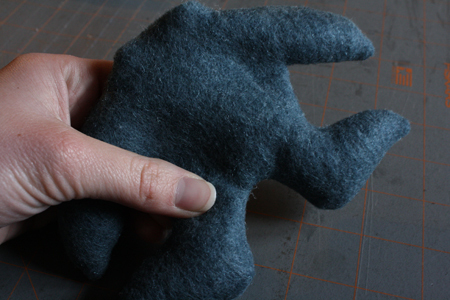 9) Turn the body right side out. Use a chopstick or pencil to poke all the edges and corners out. 10) Stuff only the feet and hands. 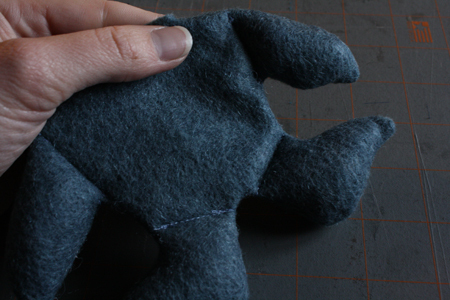 11) Sew a line between each of the four limbs and the body, separating them from each other. 12) Stuff the rest of the body. 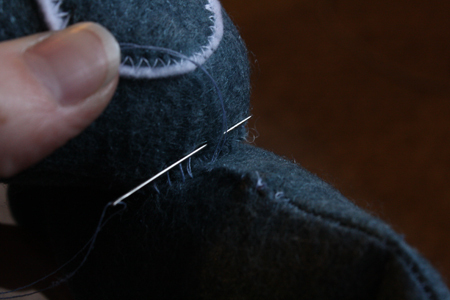 13) Using a hand needle, stitch up the opening at the top of the body. 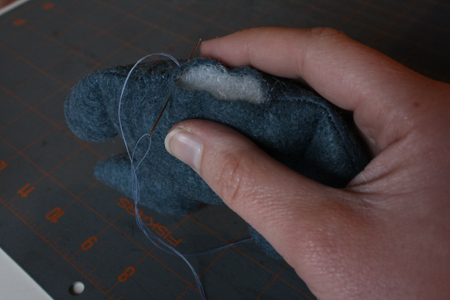 14) Next stuff the head, then stitch up the opening at its base. 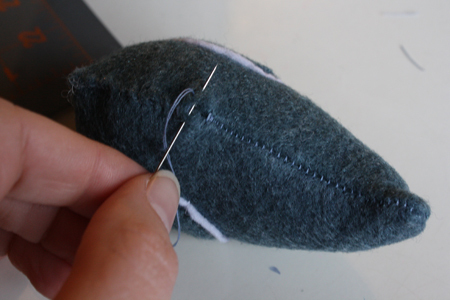 15) Sew the head to the center of the body, using small stitches that alternate between head and body. 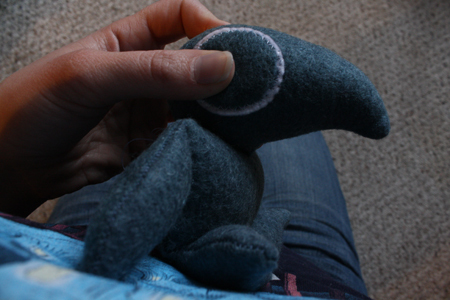 To keep the pieces in place as I do this step, I place the body, feet down, against my chest to hold it still, hold the head with one hand, and operate the needle with the other. (Obviously in the photo below I’m actually using one hand to use the camera instead, but you get the idea.) It’s a good technique for holding finicky, rolly pieces that are hard to really pin down in place, at least until we evolve enough to grow ourselves a third hand. Knot the thread and cut it and you’ve got yourself a baby Myr! 16) Now put it in a sweet little basket with a bow in your front hall and watch it weird the bajeezes out of people expecting a bunch of fleecy sheep. Or use it as an actual token in a game of Magic. 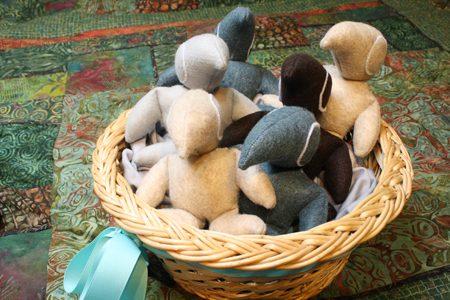 Or build an army of baby Myr and line them up in the grass for a frolicking contest. Let’s see what the Easter bunny does with that. The metal bits are random assortments of hardware, jewelry making supplies, watch parts, and bits of this clock. Roscoe! 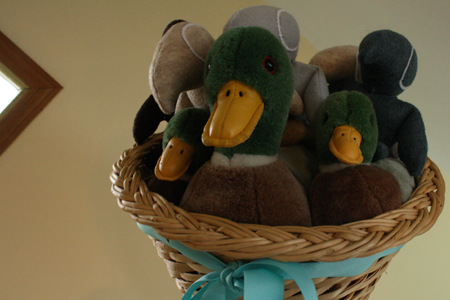 Aww, I hope ducks and Myrs will be happy together. Myr, like Magic the Gathering, Myr? I love them? Although I am terrible at these crafty things! Do you do requests? Thanks Ben! I have been known to do a particular craft and/or tutorial at the suggestion or request of other people sometimes. 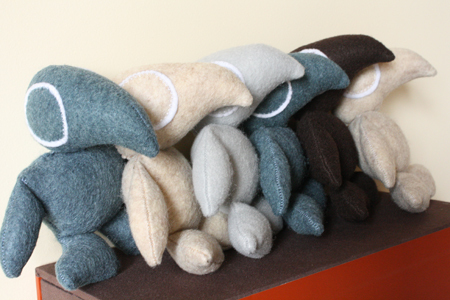 I also do make commissioned plushies, though it’s sometimes a bit of a wait before I have the time to take on a new commissioned project. if you wish to chat more about such things, feel free to email me at [email protected]. 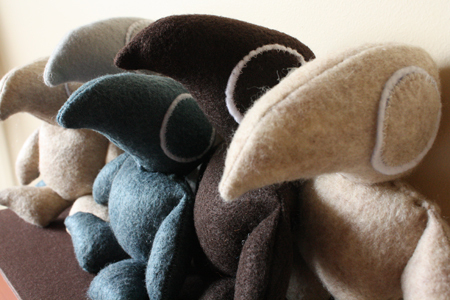 As for the plush Baby Myr specifically, I have sold a few in my Etsy store, and will probably make and post more for sale there in future, should you wish to keep an eye on it (see the widget for Tally’s Bestiary in the top right corner of the blog). This pattern got me back into sewing (from home economics in high school). 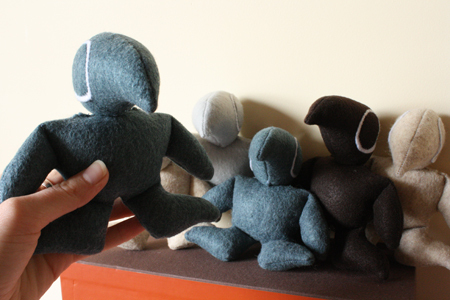 I’ve made one prototype from the pattern, then i enlarged it to 200% and made four more. here is a picture of the ones I’ve made.